(Nanowerk News) Modern electronics relies on ultrafast charge motion on ever shorter length scales. Physicists from Regensburg and Gothenburg have now succeeded in resolving a key quantum motion of electrons in atomically thin crystals on the time scale of a single oscillation cycle of light. 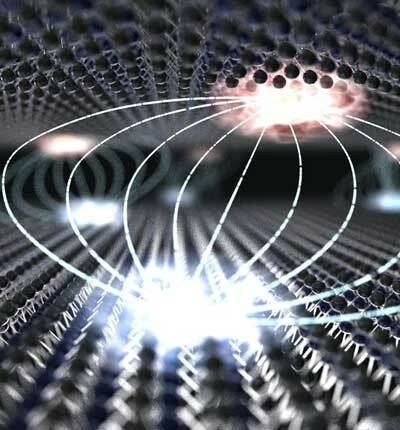 They directly observe, how the electron in a bound electron-hole pair jumps from one atomic layer to the next, creating a pair of charge carriers in a long-distance relationship, a so-called "interlayer exciton". The results have been published in the journal Nature Materials ("Ultrafast transition between exciton phases in van der Waals heterostructures"). In order to make electronics more powerful, nowadays circuits are becoming ever more compact. Here, the limit is the atomic length scale. Novel, layered crystals of so-called transition metal dichalcogenides, which can be thinned down to a few atomic layers, promise ultimately thin components such as solar cells and transistors. However, charge carriers behave very unconventionally in only two dimensions. For example, if an electron is excited by absorbing light in a transition metal dichalcogenide, it leaves behind a hole at its original location. Electron and hole can form a bound pair, an exciton. The negatively charged electron orbits the positively charged hole in analogy to an electron in the hydrogen atom orbiting the nucleus. Because of the strong attraction between electrons and holes, these excitons are also stable at room temperature. "Since the layers are atomically thin, the electron still feels the hole’s presence, so they can continue to interact across the layer," explains Fabian Mooshammer, PhD student and co-author of the study. Due to the spatial separation, however, it takes much longer for the electron to return to its initial position. This significantly longer lifetime is only one of the reasons why interlayer excitons have caused a lot of excitement in recent years, both in fundamental research and in optoelectronics. The scientists were able to observe the behavior of these interlayer excitons during and after their formation. They used a home-built super slow-motion camera to study processes taking place within a few femtoseconds – the millionth part of a billionth of a second. "For the first time worldwide, we observed the formation process of an interlayer exciton and measured how strongly electrons and holes remain bound," says Philipp Merkl, first author of the publication.